Sting.com > News > Happy Holidays to everyone! 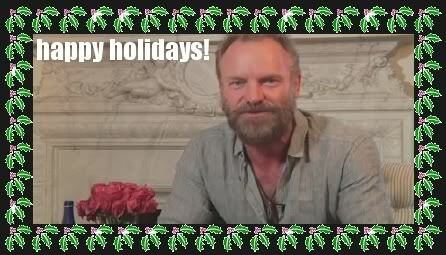 Check out a special holiday message from Sting and download an exclusive 2010 Sting.com calendar! Click here to watch a holiday greeting from Sting and click here to download a 2010 Sting calendar that you can print off in readiness for the new year. Just print off on some good quality paper, spiral bind it and you're all ready for 2010!